There are twelve Stormking models in Hamilton's lineup and if you managed to locate an example of each one you would assemble a very nice mini-collection. You'd have to be very persistent though because a couple of them as super-rare. In fact, you'd have as much chance of assembling a complete Stormking collection as you do of landing all of the CLD models. It's tough to do, but it's sure fun to try. 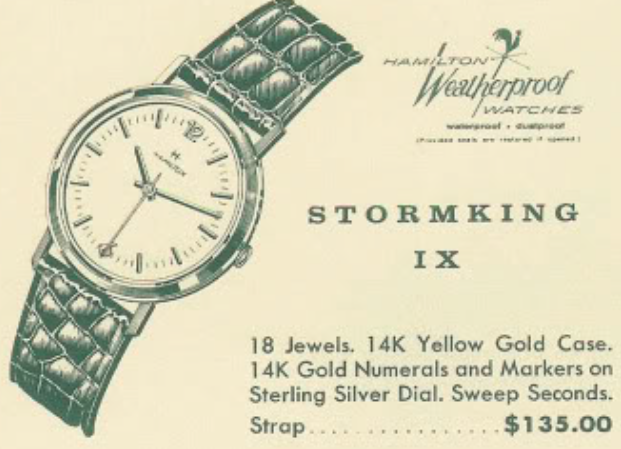 Well here's another checkmark for the Stormking line... a 1961 Stormking IX. It was made for only two years. Stormkings come is stainless steel, gold filled, and solid gold in 10, 14 and even 18K gold. That's probably why some of them are so hard to come by. The Stormking IX is one of the 14K solid gold models. It comes in a one-piece case with a sterling silver dial and features solid 14K numerals and markers. Tucked behind the dial is the 8/0 sized 735 movement with 18 jewels. This high grade movement is based on the older 748 movement from the 1940's but offers shock jewels to protect the balance staff. My Stormking IX project watch arrived in very nice shape. My merciless camera makes it look a little worse than it first appeared to be. I think a new crystal is all this watch will need after I overhaul the movement. The back of the case has three nicely done initials. If you look closely, you'll see the 3 o'clock marker is missing in action. Luckily I found it next to the 10 o'clock marker. The 735 is a nice movement but it's an intimidating movement to overhaul. It's very easy to take apart but reassembling it can drive you to distraction. It has a train bridge that must accommodate four pivots at the same time and the arbors for each wheel are very long so they are extremely tricky to get lined up at the same time. This style of movement is very interesting because it has an extra wheel... a 5th wheel that goes between the 4th wheel (that drives the second hand) and the escape wheel. Before I tackle the movement I will reinstall the loose hour marker. You can see there are two posts on the back of the marker. Each applied gold device is riveted to the dial so all I need to do is line up the posts of the marker with the holes in the dial and then press the marker in place. The back of the dial is ground down a little to hold the markers in place. I like to put a dollop of UV glue over the holes on the back of the dial to lock the loose marker in place. The one-piece case is typical of other one-piece designs and uses a two-part stem. While all the parts are bing cleaned, I'll get out a new crystal to install after everything is reassembled. It took a few minutes to get the train bridge to drop into place but once everything is lined up the bridge will seat itself. So if it's not seated you know something is not right. You might be tempted to force it but that will result in a broken escape wheel or 5th wheel pivot. The movement is now running briskly so next I'll see what it looks like on the timer. 6 seconds fast per day... low beat error and nice amplitude... not too shabby. A new crystal and a fresh genuine croc strap complete the restoration. This is a sharp looking watch... the radial finished dial is original and the Hamilton logo is very interesting. You don't see this style of serif-font very often.